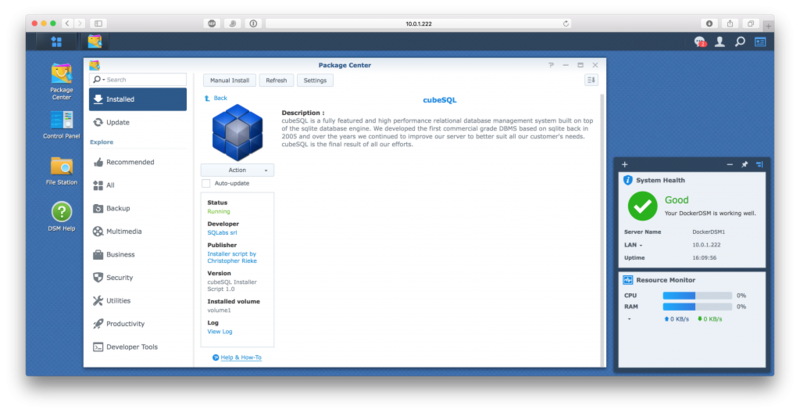 Thanks to Christopher Rieke, there is now an installer that is able to install cubeSQL on Synology NAS. Script is tested only on 64bit systems and depends from the return value of the the “uname -m” command. You need to create a shared folder called “cubeSQL” to be able to successfully launch cubeSQL. He decided to store databases and settings there. So it is easy to make a backup of these folders. A shared folder called 'cubeSQL' was created. As stated, this package is only supported on "64bit systems". Yours isn't one (http://www.synology-wiki.de/index.php/Welchen_Prozessortyp_besitzt_mein_System%3F). installed, thank you but how can i start admin? Admin is a GUI application that you can install and start from Windows, Linux or Mac. Just double click on it and connect remotely to a cubeSQL server. I did not understand, how to install cubeSQL on my DS411+II. Can you help me please. Step by step. THX! Is it possible to translate this script to install cubeSql on a QNAP system!? QNAP system uses an ARM CPU and cubeSQL for ARM processors in not yet available. We currently do not have a release date for an ARM version. Salve, avrei necessità di installare la versione 4.5 al posto della 5.5, secondo voi è possibile? Si è possibile ma non consigliato. La versione 5.5 risolve a diversi problemi presenti nella vecchia versione 4.5. Al momento non possiamo offrire supporto per questo tipo di installazioni custom. I have successfully installed cubesql on my synology. But I can't start the database. The Light has shown red and the Button "Start" is unavailable. What I'm doing wrong? A red flag usually means that the database is encrypted and you haven't set its encryption key via the Admin app. hi, there is an simple hack to enable this package for 32bit synology arch. just add "i686" arch into the list in "INFO" file. I have managed to import the database on my disk station and it is working. I have just one small question: how do I manage to update to the current version of the program? i have install the cubeSQL on my Synologie. I need it to use with MonKey Office. But wenn i want to open the Database i receive a message that i no have a license. How can i add a license to my cubeSQL on the Synologie? arch="x86 avoton cedarview braswell bromolow dockerx64 apollolake"
Can anyone help me (dummy) to get this installed on a Synology DS918+? You have to update the Link to the current software version. As it refers to an old version it does not work. Try to copy https://www.sqlabs.com/download/cubesql/561/cubesql_complete.zip to the line where your DS wants to know where to download it. can you explain to me how I can install the script on my ds918 +? Any one have an idea how we can fix it...? I am trying to install cubeSQL on my DS3615xs with DSM 6.1. Shared Folder "cubeSQL" is created. But when I run the script I get the message "cubeSQL could not be installed". The Volume with all my data on the Raid gets lost and I have to restart the NAS. What is wrong here? I am trying to install cubeSQL on my DS3615xs with DSM 6.1. Shared Folder "cubeSQL" is created. But when I run the script I get the message "cubeSQL could not be installed" and the Volume on the Raid gets lost and I have to restart the NAS. What is wrong here? Hey, I have the same issue. Suddenly after installation the volume is lost!!! Please feedback someone with explanation and support. Thanks to XDL it worls. Just copy the new URL of the current cubeSQL software. Hi, can you post an instruction for dummies ? I seem to have it installed but i cant access it from sql admin, something must be wrong. I have installed the tool. But I don't know how to configure for my website.